The popularity of 100% douglas fir wood pellets has been spreading rapidly in recent years. What makes them so special? Well, so say the high heat out and low ash levels are impressive would be an understatement. These softwood pellets are made from 100% douglas fir wood fibers – which is one of the hottest burning wood species in North America. 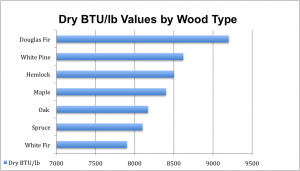 Check out this chart showing the relative heat output (as measured by BTU/lb) from various wood species. In addition to their superior heating ability, wood pellets comprised of 100% douglas fir create 2-3 times less ash than your average premium grade pellets. Ash levels this low provide a huge advantage in how often you must clean your stove or fiddle with your burn pot. So why are douglas fir wood pellets typically more expensive and not as widely available as other types of pellets? Unfortunately, douglas fir trees grow in the Pacific Northwest, so they must travel a long way to reach us here in the Northeast. As a result, douglas fir pellets incur much higher transportation costs and make it difficult for retailers to offer them on the eastern half of the country. Note: Be careful of brands that claim to be a douglas fir “blend” – as some mills will add a small amount of douglas fir material in order to advertise them as douglas fir pellets. There is a huge difference between a 100% Douglas Fir pellet and a blend. Our Cleanfire Douglas Fir Wood Pellets are comprised solely of douglas fir wood fiber, and are a favorite among our customers. Enter your zip code at www.Woodpellets.com to see what’s available to you in your region. Not sure if Douglas Fir pellets are right for you? Call us at 1-800-735-5387 to speak to an expert!